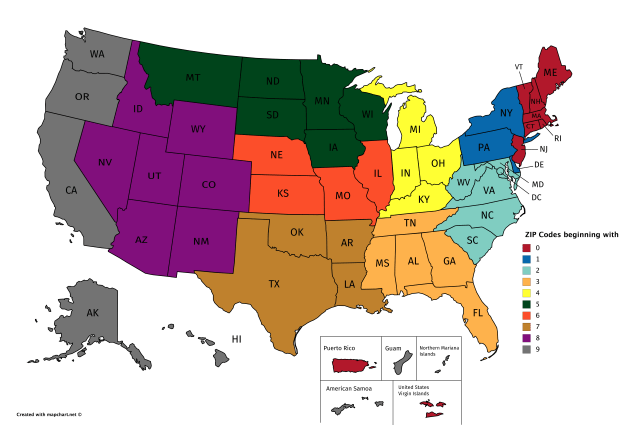 The map above shows US states by the first digit used in their ZIP codes. Not surprisingly, the numbers start from 0 in the east and get higher the further west you go. You can look up any ZIP code in the US from the USPS here. Only the people working at the U.S.P.S. in the mid-1960s would know why New Jersey shares its ZIP- code prefix with the New England states, and not with the other Middle-Atlantic states (less Maryland, which the U.S.P.S. decided was part of the South). Is it because of the distribution station in Kearny, NJ? handles most of wall street mail. It is so surely as to distribute the number of addresses out more evenly, especially as they were in the 60s , so NJ goes with the smaller eastern states rather than the very populous NY and PA.
Also the western border of NJ is more aligned with the NE states and they have went in a columnar view. New Jersey’s weirdness is even greater than this map shows, as most zip code regions further break down into coherent blocks. But NJ’s internal zip code distribution is decidedly more disorganized.